Left-wing NGO and underminder of Israel, Freedom Protection Council, will no longer receive funding from the EU. On the same subject, Netanyahu recently rebuked Norwegian Foreign Minister Ine Eriksen Soreide when the two met in his office in Jerusalem on Sunday, accusing Norway of overtly funding anti-Israeli activity. The Israel Defense Forces issued its latest report on the attacks agains Israel. Hamas began shooting projectiles at Israeli civilians starting at 7:37 pm on Wednesday evening and launched them consistently until early Thursday morning. Read the full IDF report HERE. 19 injured, 1 critical in rocket attacks from Gaza against southern Israel. Rocket strikes Be’er Sheva for the first time since 2014. Sderot children in bomb shelters. Hamas comfy in their beds. Read what Yesh Atid MK Yair Lapid has to say about this. Yarin Shitrit, 16, wounded in the leg while running to a protected area during the attacks. He spoke to Arutz Sheva about the lack of freedom residents of the south have while under fire. We’ve learned that reports are now surfacing that Trump administration officials have criticized the UN Relief and Works Agency (UNRWA) as recently as this past Sunday. They’ve characterized the UNRWA organization as a fundamentally flawed, cash-strapped organization hampering Palestinian growth. We like Israel Tourism Minister Yariv Levin’s comment about the Nationality Law. BIGA – Build Israel Great Again! Now that the atmosphere under President Trump is changing, his support is seen as the key to building more Jewish homes, said Yesha Council head Hananel Durani Wednesday to former Arkansas governor Mike Huckabee. 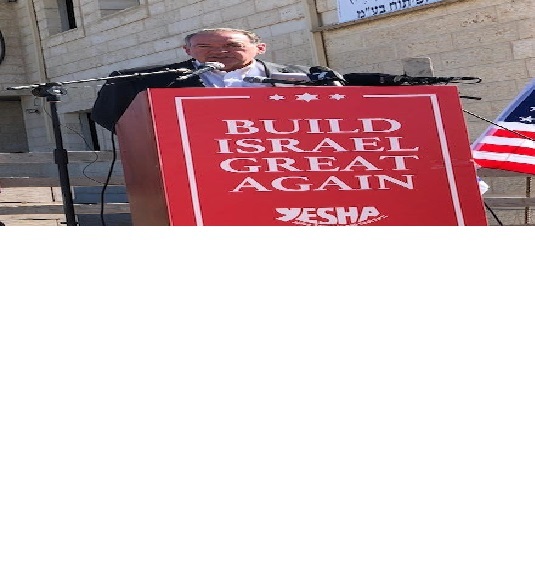 The Yesha Council and Huckabee celebrated the construction of 900 new homes, 600 of which are in the final stages of building. On AFSI’s April mission trip we visited the wheat fields of Yitzhar with Ayelet and Akiva HaCohen whose drive and determination have created a very successful flour mill. Neighboring Arabs are constantly planning to burn down the fields. AFSI agreed to help with building a fire wall. Helen Freedman recently corresponded with Ayelet and Akiva to see if they were safe from the fires. “Today we had another fire that the Arabs torched, this time closer to our house, but we weren’t worried because we knew the fire wall path that we paved with your contribution would stop it and that is exactly what happened! Read about the squad of US firefighters who are volunteering (and not all are Jewish) to protect Israel’s south from the Hamas kite terror attacks HERE. Thank you! Recognize Golan Heights Sovereignty Now! EMET has launched a petition today calling on the US Administration to recognize Israeli sovereignty over the Golan Heights. Because of the seven-year brutal Syrian civil war, the Islamic Republic of Iran has taken advantage of the situation, and Iranian-backed Hezbollah forces have penetrated as far south as the Syrian town of Quneitra. Iran is determined to build a land bridge stretching from Tehran to Beirut to Damascus and to the Mediterranean Sea. A United States recognition of Israeli sovereignty over the Golan Heights is critical at this time, to ensure the safety and national security interests of the U.S. and Israel, and it would send a strong message to Tehran that their hegemonic aspirations must not go on, unchallenged. Members of Congress have called for U.S. recognition of Israeli sovereignty over the Golan Heights, but it is important that the American people send a message to the Administration as well. We encourage everyone to sign and share the petition with your friends, colleagues, and contact lists. When 100,000 signatures are reached, the names will be delivered to the Prime Minister Netanyahu’s office. Two hundred activists held a protest on the ruins of Sa-Nur as part of a campaign to force the government to rebuild the community. Sa-Nur was one of four northern Samaria communities that the government destroyed in 2005 as part of its disengagement plan. In AFSI’s July 23 newsletter, we first reported that the residents of the Sa-Nur and Homesh communities turned to leaders of the coalition factions, demanding that the Disengagement Law be approved to end these disgraceful expulsions from northern Samaria.